Penthouse with 2 private terraces, offering unique views towards the Cathedral. 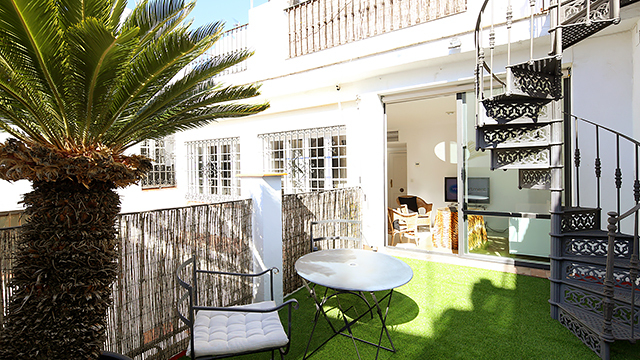 Located in the heart of the historic centre, next to Plaza Nueva, at five minutes walking distance from the Cathedral. 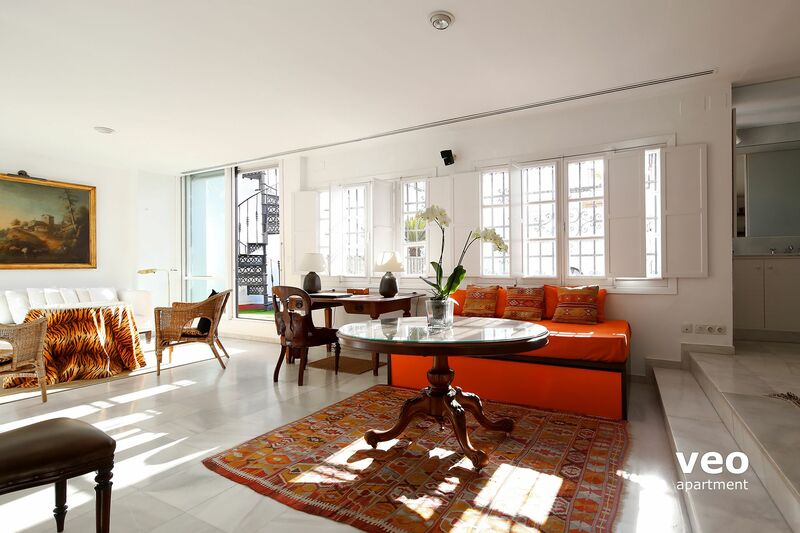 The apartment comprises one large open space which can accommodate 2-4 guests. The sleeping area has a double bed (150x200 cm) and the living area two twin beds (the second single bed is a pull-out stored below the other). 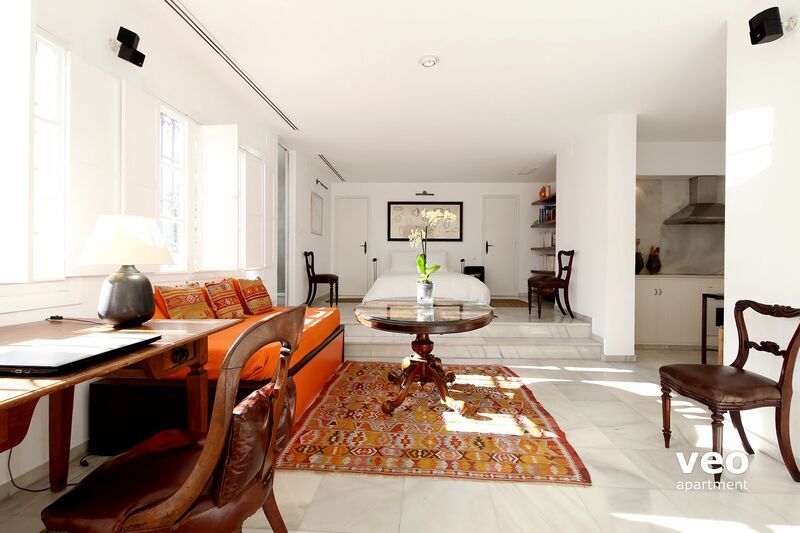 Modern comfort meets traditional Sevillian architecture to create a truly harmonious atmosphere. The interiors are spacious and bright, with windows throughout. The apartment faces south and has sun light for most of the day. 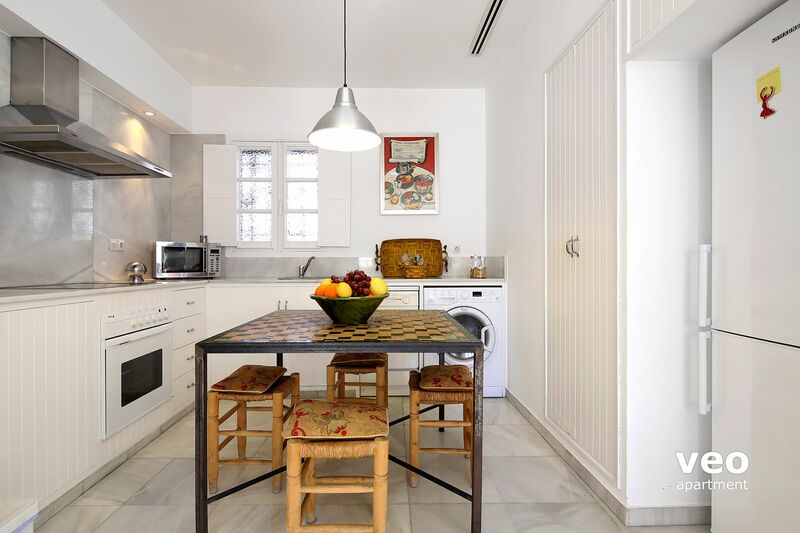 The kitchen is perfectly equipped for self-catering, including: oven, dishwasher and washing machine. Dining table and chairs. 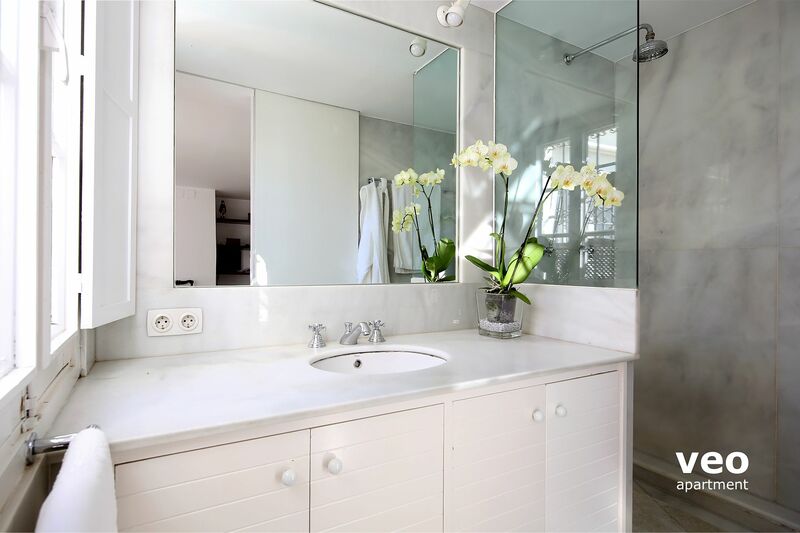 The marble bathroom has a walk-in shower and washbasin, and there is a separate toilet. The living room has a large sofa, table, 2 armchairs and TV. Working desk with a chair. 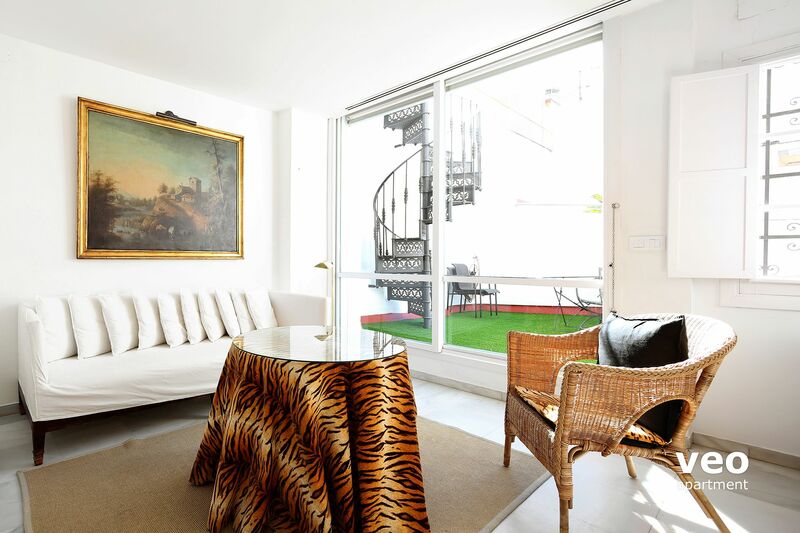 Central air-conditioning (hot/cold), free Wi-Fi internet access, marble flooring throughout and original artwork. There are 2 private terraces. 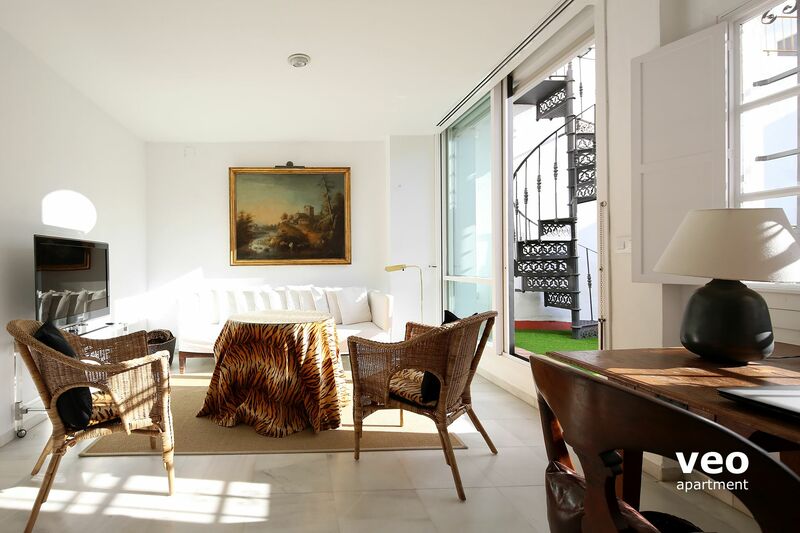 The lower terrace feels like an extension of the apartment and is furnished with table and chairs. 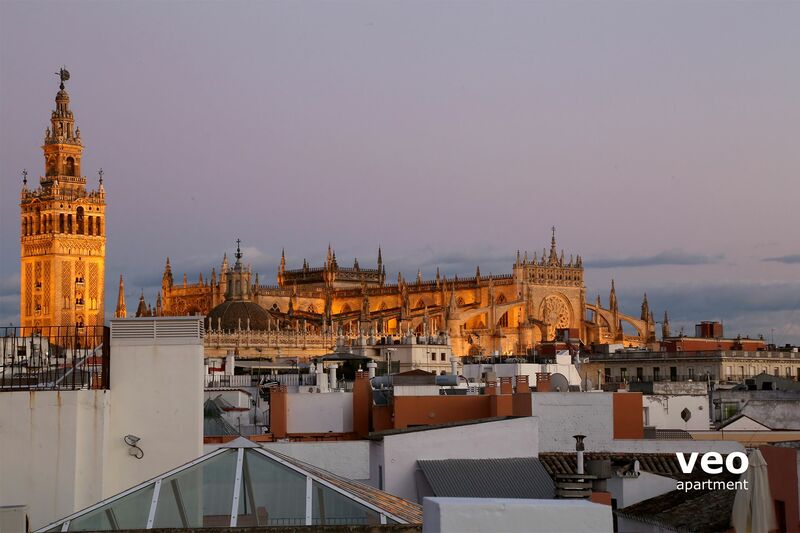 The roof-top terrace has plenty of sun, inviting you to sunbathe or enjoy the balmy Seville nights in good weather and exceptional rooftop views, including the Giralda and Cathedral. 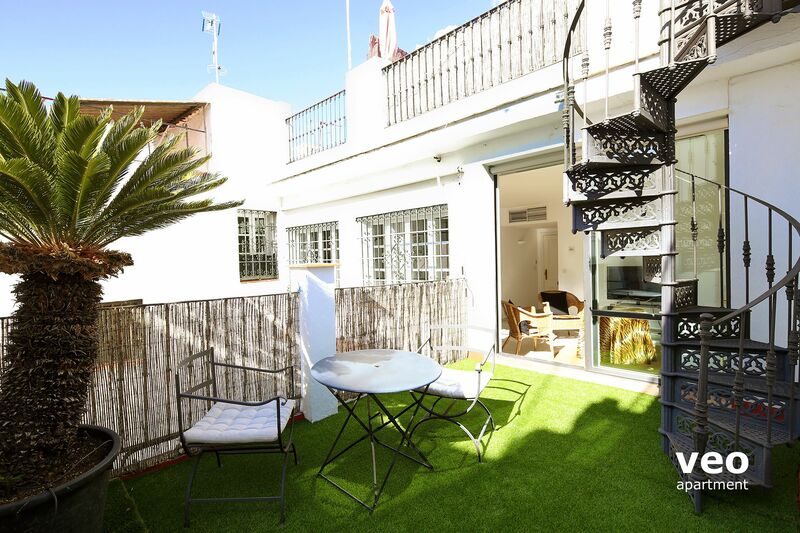 Terrace well decorated and furnished with plants, table, 2 sitting benches, 2 deck chairs and parasol. The apartment is on a third floor of a residential building, with access via stairs (NO elevator). 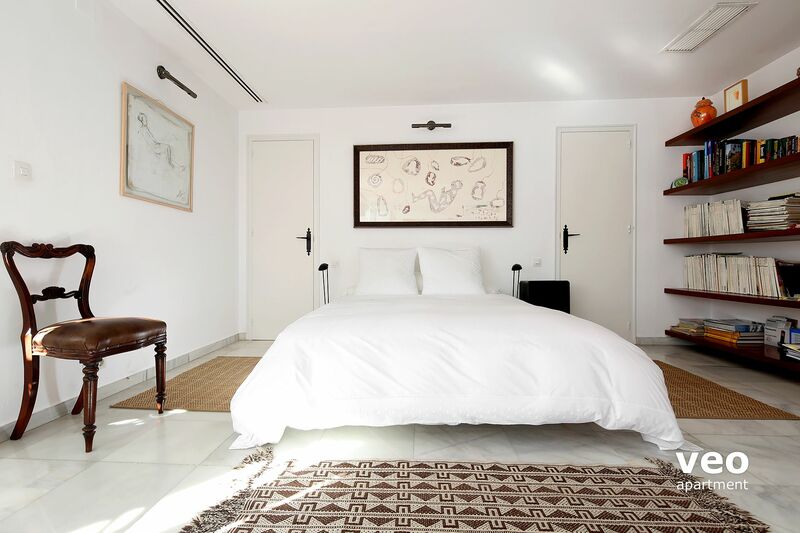 Despite its central location, "Plaza Nueva Loft" is extremely quiet for sleeping, without exterior noises. Daily rate: EUR 15. Reduced price at car park "El Arenal". Located at 500 m from the apartment. Reservation by email required. 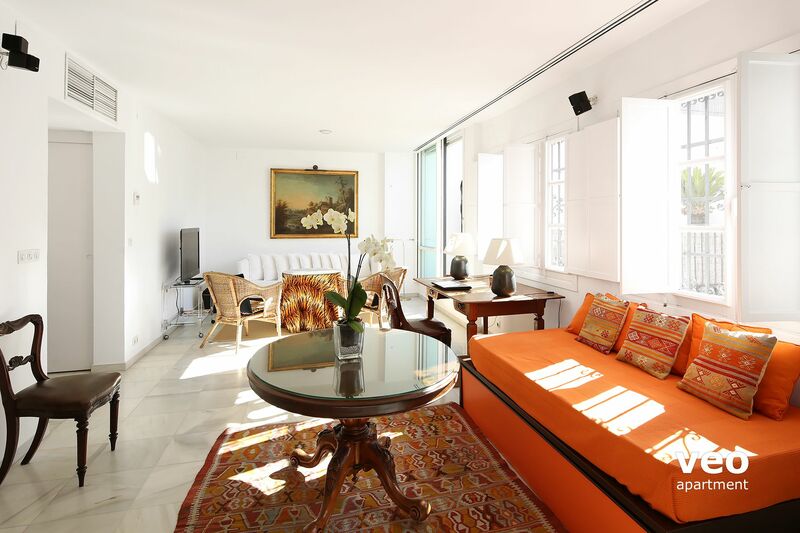 "A very tasteful and comfortable apartment with a superb terrace." "Excellent attic apartment with terrace"
we stayed 10 nights at Plaza Nueve terrace from 2 April 2018, we are a couple in our late fifties the one bed accomodation was more than comfortable for us, the living space open kitchen dining and lounge with shower room bathroom and large walkin closet, the kitchen had all utdnsils we required. 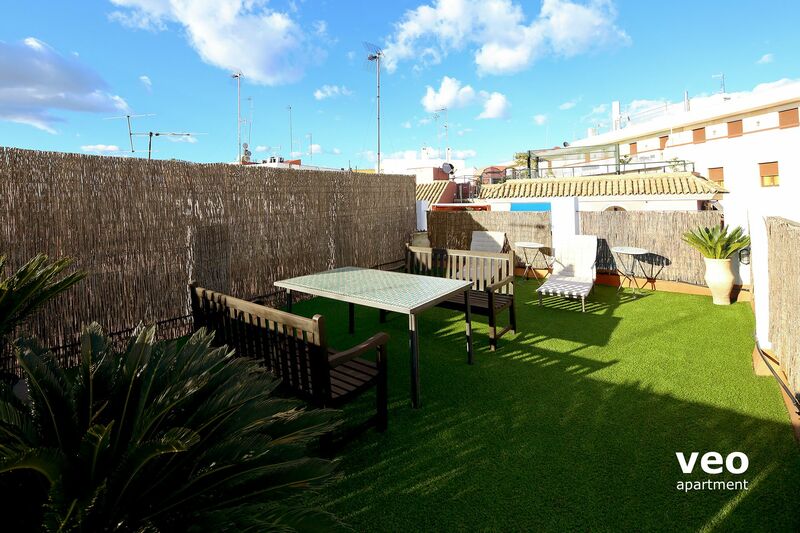 The terrace space of which there are two push this apartment in excellent category for us, one on the same level excellent for eating on and the roof for relaxation.The location is ideal 30 steps to plaza nueve, bars restaurants, a supermarket across the road which opened late even on a Sunday. As we have experienced on previous occasions the VEO staff provide excellent service and support if required from booking to arrival no doubt VEO are a professional organisation. "Everything you could ask for!" A beautiful apartment in an ideal location, equipped with every possible thing you could require. 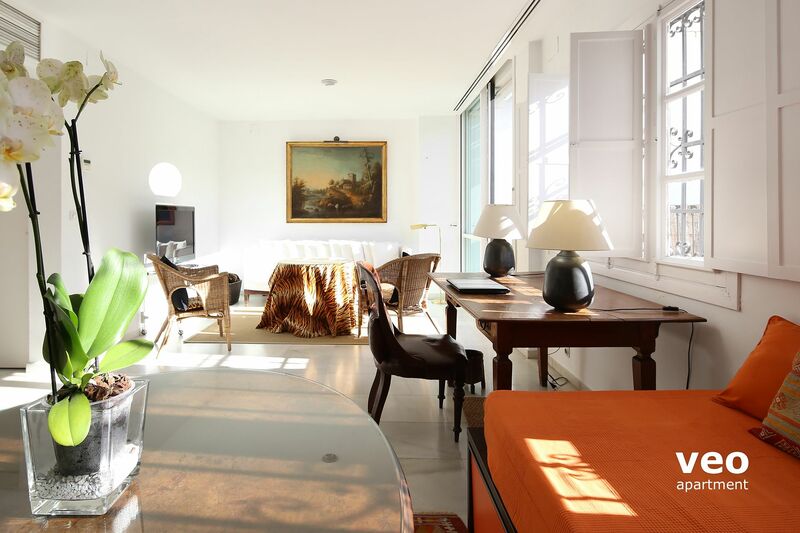 The apartment is very elegant and filled with light and the outside spaces are incredible to find in the very centre of the city. While there was an issue with the key not working initially it was sorted out with the minimum of fuss. we needed a delivery from amazon while we were staying and the staff in the office were very helpful in accommodating this. Everyone I dealt with from start to finish was extremely professional and helpful. 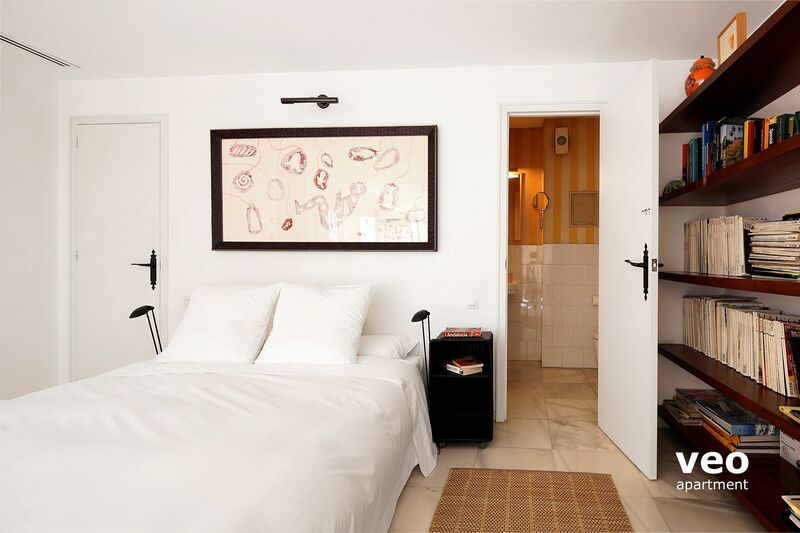 We enjoyed our stay and the information provided by Veoapartment before hand was very useful. Apartment is well equipped especially for clothes storage . Had a great 8 night stay in this fabulous apartment. Fantastic location, quiet, spacious and spotlessly clean. The bed was lovely and hard. The sun umbrellas were of good quality so provided sufficient shade from the sun. We had issues with no hot water two days and the air con was broken when we arrived but Veo apartment were so responsive as were the management company and the problems were fixed as soon as possible. The wifi strength is very good. The stairs up to the apartment is hard work and washing powder wasn't provided. Smell of drains a couple of nights in the apartment and in the apartment building. Check in and check out was easy. We would definitely stay again and recommend to others. "Guter Ausgangspunkt, um Sevilla zu erkunden"
Die Lage des Apartments ist sehr gut, man sollte jedoch gerne Treppen steigen, den es gibt keinen Aufzug. Rundherum sind viele kleine Geschäfte, Bars, Restaurants, alles haben wir zu Fuß gemacht und so die Stadt ein bisschen kennen gelernt. Das Apartment ist für zwei Personen sehr schön, für vier Personen finden wir es etwas zu klein. 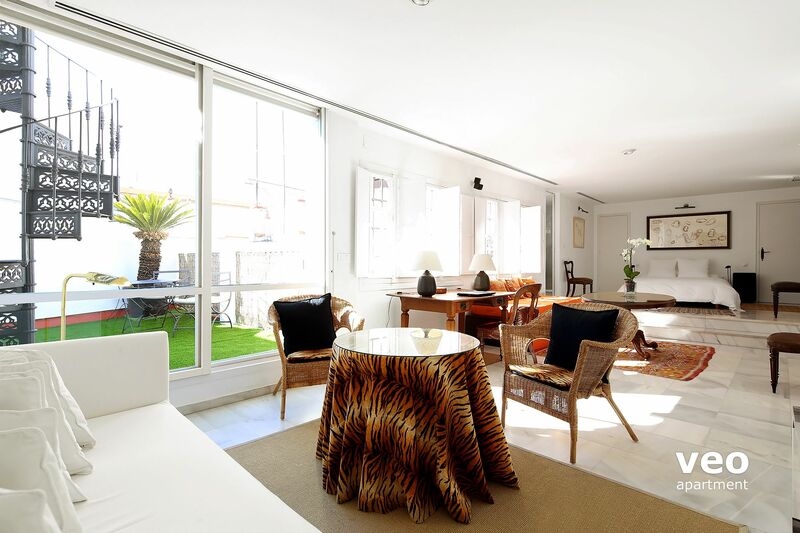 "A comfortable apartment in a great city"
Apartment with great location and a sunny roof terrace in a wonderful city. "Superbe appartement au coeur du Centre-ville de Séville." Appartement propre, moderne, bien équipé pour faire la cuisine, situé à deux pas de Plaza Nueva et à quelque 6-7 minutes de marche de Corte Ingles. Deux terrasses agréables, dont une avec vue imprenable sur la Giralda. Non recommandé pour des personnes ayant des problèmes locomotion parce que sans ascenseur et au 3ième étage. "Luxury Apartment in the city center"
Perfect location in the city center- just a few minutes to the cathedral, 'Spar' shop just oppposite, nice Tapas bar around, Shopping street and tram almost next door and also the metro is not far away - and although at Plaza Nueva very quiet. The apartment just looks like the pictures - it is huge and the two private terraces are even bigger... we really enjoyed having breakfast every morning at the top terrace, watching the sun rising. You have also a stunning view at the cathedral - at night it is even more beautiful. It was simple to get the apartment's key, although our plane was delayed. The apartment is clean, well equipped - you find whatever needed - honestly! WIFI is very quick. AC is working well. And the dishwasher was a great bonus. We just loved staying there for a week and definitely recommend it. "Excellent location, terraces and compact apartment." A compact apartment, livable and with great terraces. Location could not be better. "Excellent and Comfortable Living Space with the PERFECT Location"
Our nearly three week stay was fantastic. The apartment is gorgeous. The views from the upstairs terrace leave you speechless. Our only regret is not finding out that they offer cleaning and laundry services until the last day (There's a sheet in the Apt. folder that spells out the prices - very reasonable too! Grr.) You cannot beat this location. It is quite simply in the epicenter of everything that is Sevilla. "Spacious and tastfull apartment, well located." A touch of luxury... and very spacy. Everything about this apartment was exceptional. We loved it and enjoyed it being our home for the period. We would definitely book again. Your service was perfect and we're most appreciative. However, I had one problem only: we had 2 heavy suit cases and 2 small cabin baggage cases. We had just completed a 25 hour flight. It would have been decent and good service if the lady who met us didn't watch me carry ALL the cases up to the top floor-she could have offered to take one of the light cases (7kg) to help me. Reply Veoapartment: We apologize for the inappropriate behaviour of the check-in agent. "Exceptionnel à tout point de vue !!" Un séjour excellent dans ce très bel appartement correspondant parfaitement à sa description. "Excellent location, surprisingly spacious studio apartment." Overall this is a great apartment. The location is fantastic, with the Cathedral, Palace, shops and lots of restaurants nearby. 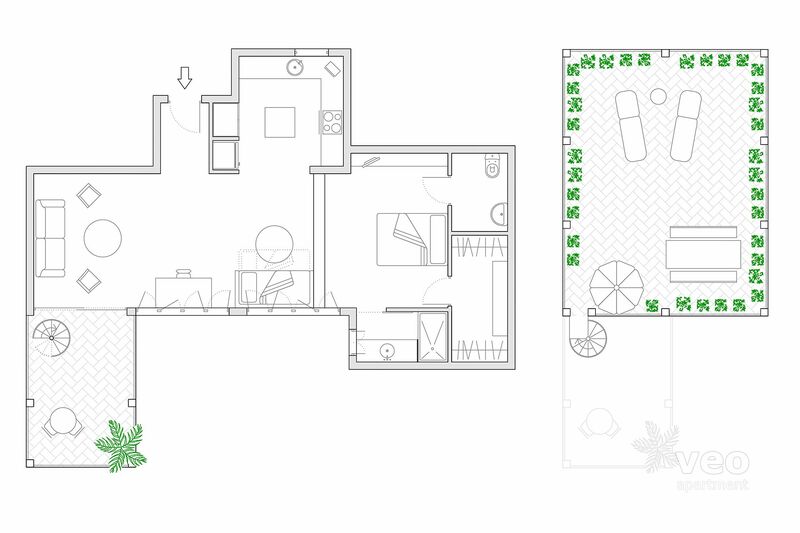 Although a studio there is plenty of space for two people and the layout works well. The terrace is lovely with a great view of the Cathedral. My only criticism would be that the toilet needs fixing, it works but can continue flushing if you don't adjust the handle. However this is minor, I would definitely recommend the apartment and if in Seville again would stay here. 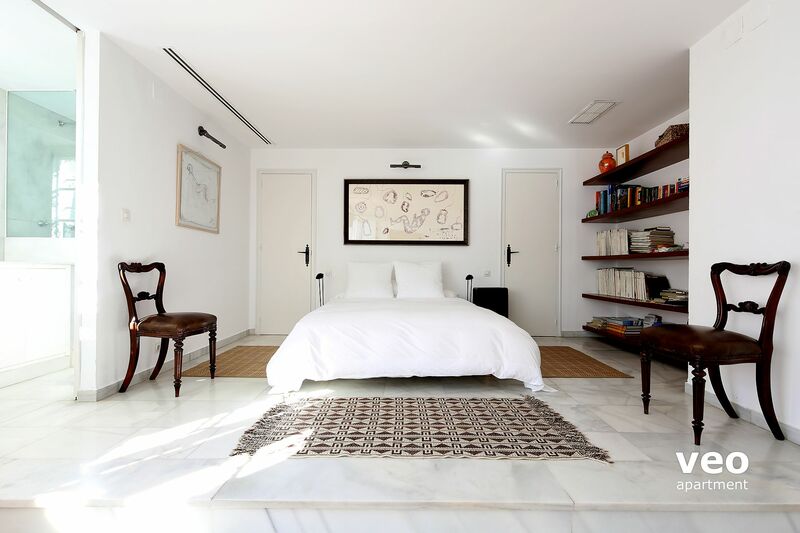 Reply Veoapartment: Dear guest. Thank you very much for your comments. We're truly happy to know you've had a wonderful stay at our holiday home. We confirm we've fixed the toilet flushing problem. Hope to welcome you again in a future visit to Seville. Our best regards. Die Wohnung ist ideal und zentral gelegen. Alle Sehenswürdigkeiten, Bars, Restaurants und verschiedene Stadtteile sind in Laufdistanz erreichbar. Die Wohnung bietet alles, was man zum Wohnen und sich wohlfühlen braucht. Zudem verfügt sie über eine sehr schöne Dachterrasse, von der man einen tollen Rundblick hat. Ich fühlte mich sehr sicher, da nach der Eingangstüre noch ein Tor und dann erst die Wohnungstüre kommt, man braucht also mindestens 3 Schlüssel. "Brilliant - will definitely return ay some stage"
Fabulous apartment within easy walking distance of sights, bars, shoos and river. "This is a great location "
This was my three-week stay in the Plaze Nueva loft. 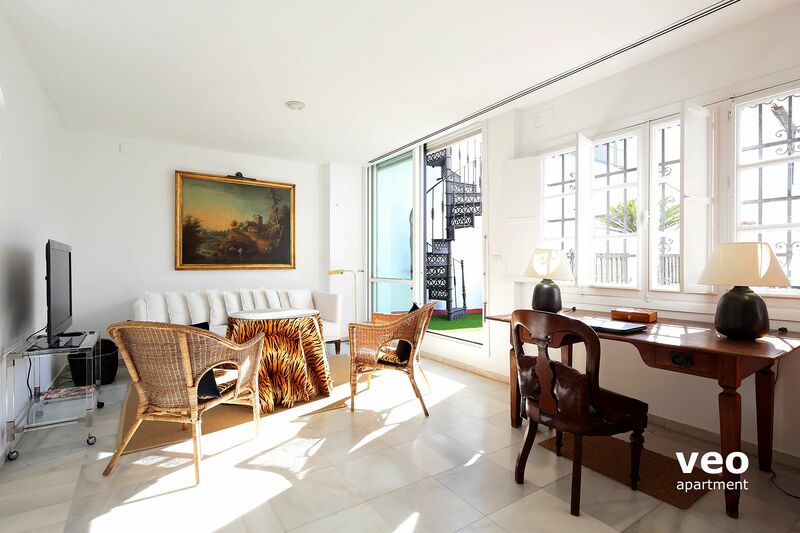 I love this comfortable and spacious studio apartment and you cannot beat the location for easy access to anywhere in Seville (with the tram stop in the plaza with the Cathedral and tourist sites just around the corner). There is a supermarket and an excellent patisserie just steps away. I love the private roof terrace, although I was disappointed that the garden was not in bloom this summer as it was last year. 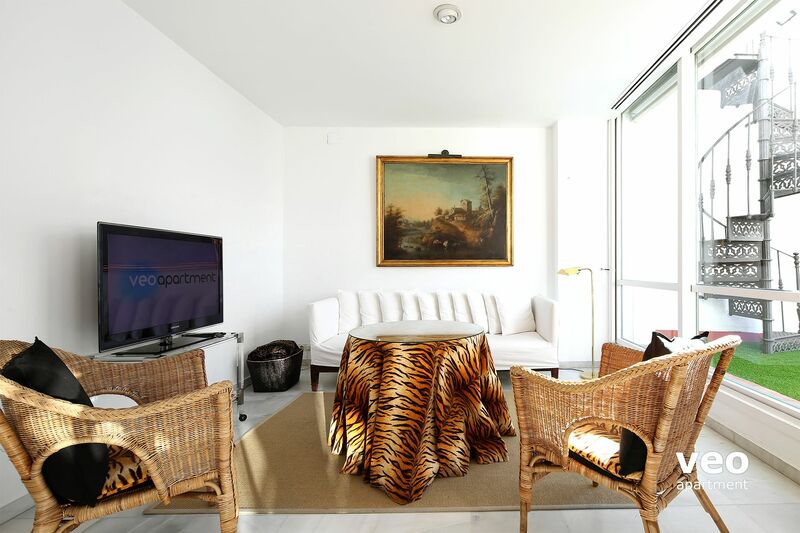 It is always a pleasure to deal with veoapartment as well as the manager for this apartment. "Bonito loft muy céntrico y cómodo"
We loved our stay at the Plaza Nueva Loft. The central location is the best in the city. 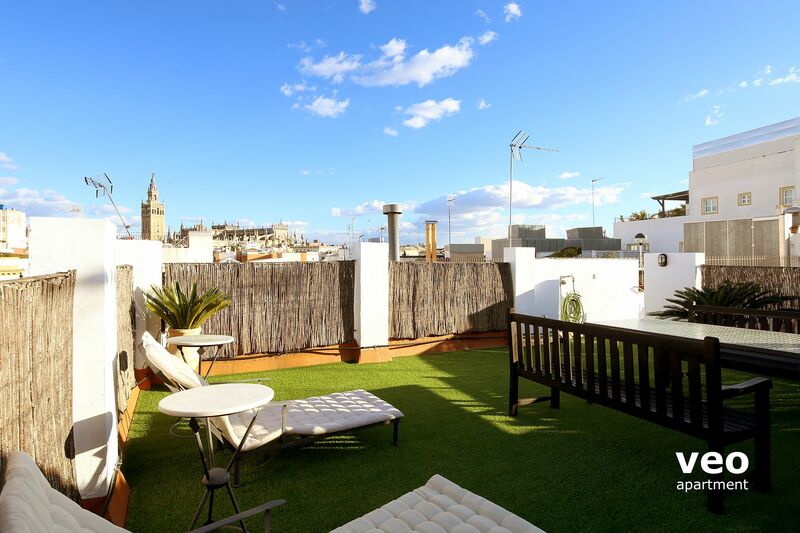 The roof top terrace is an added bonus, although we spent most of our time exploring Sevilla and taking advantage of the great restaurants, sights, parks, and shopping. The plaza Nueva loft was perfect for us. 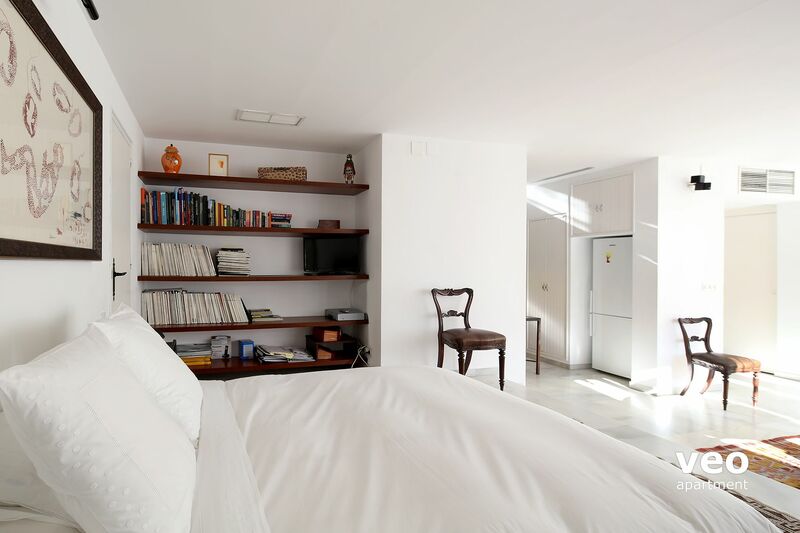 "Quiet, clean apartment in excellent location"
We, a retired couple, stayed at this studio apartment for most of the month of March 2014 and were very happy with it. It's much as shown in the photos on the website: a large open space with a few steps up separating the sleeping area from the larger living area. It was perfect for two people, and would have accommodated two children on the daybed, although without privacy. The kitchen was well-equipped, including a dishwasher and a clothes washer. Clothes could be dried on a rack or on clotheslines on a shared terrace. We had lunch on the private terrace off the living room most days that we were there at lunch time and often had a glass of wine on the upper private terrace, which was full of shrubs and flowers, where we could watch the sun set on the Giralda and the cathedral. Windows located along most of one side made the apartment bright during the day, but the shutters kept it dark at night. The apartment is wonderfully quiet, with virtually no street noise and almost no noise from other tenants, especially at night. The location just steps from the Plaza Nueva meant it was barely 5 minutes to the Cathedral and within walking distance of almost all the tourist sites and dangerously close to the main shopping area. There are innumerable restaurants, cafes, bars, tapas places all around. There is a small Spar market right across the street and a very large supermarket in the basement of the Corte Ingles home store a five minute walk away. The property managers were helpful and responsive to any needs that we expressed. It felt like home and we were sorry to leave. Appartement agréable et très bien situé. Nous avons séjourné en plein hiver et n'avons pu profiter des jolies terrasses. La clim réversible était neuve et ne fonctionnait pas. C'est pour ces 2 motifs que notre avis n'est pas plus chaud que le chauffage . 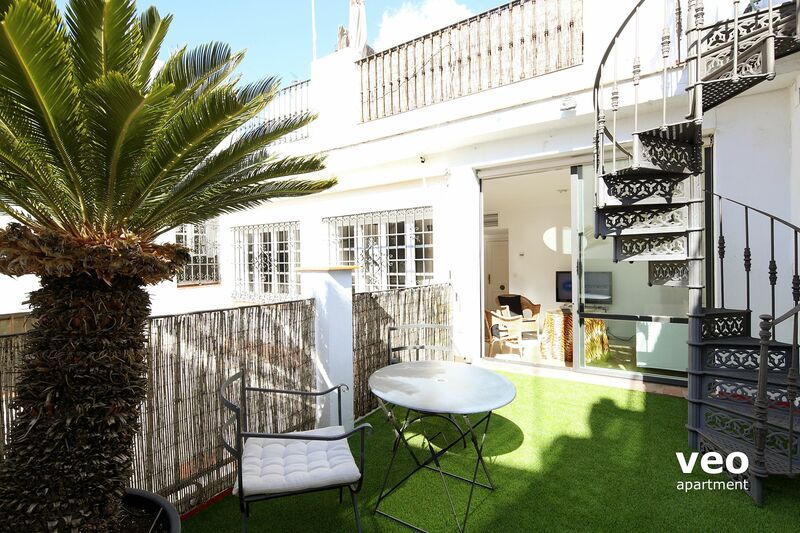 The apartment is situated in the centre of Seville which is ideal because you can walk easily to all the things you want to see or do. 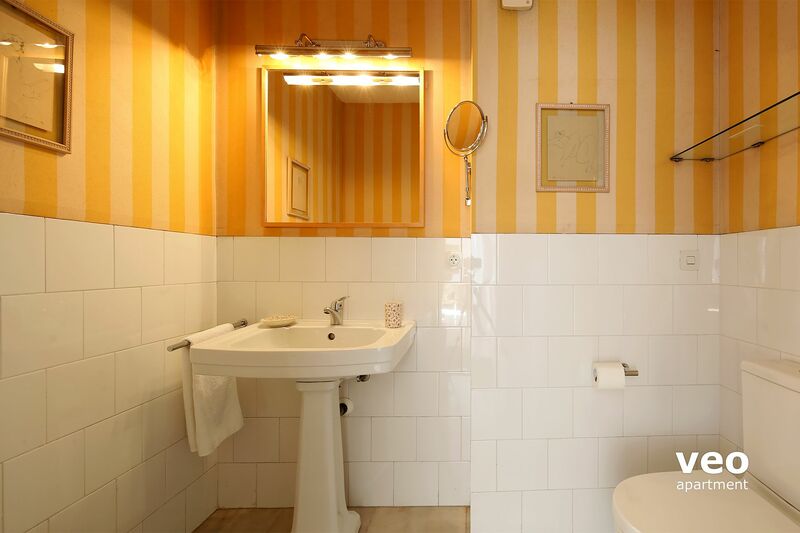 Everything you need is available in the apartment and it has a cosy atmosphere. 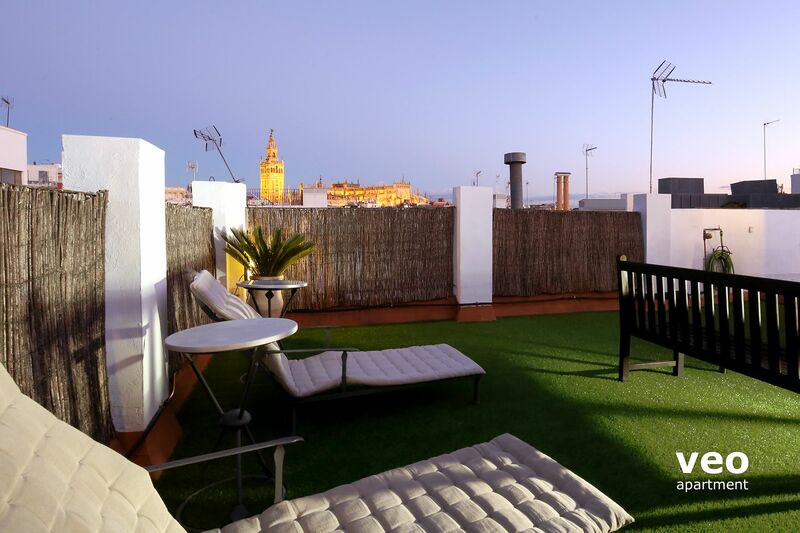 The roofterras gives you a beautiful view upon the city and the cathedral. I would definitely come here again, after a one-month stay it felt like my home. "Brilliant! We enjoyed our visit very much." Location excellent. Condition of the apartment, crockery, cutlery, linen and appliances excellent. 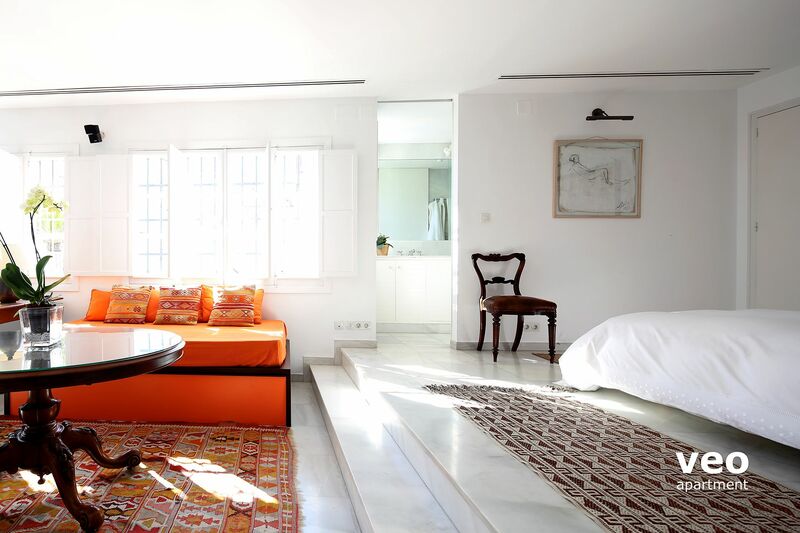 "Brilliant loft apartment near Plaza Nueva"
Exactly as seen on web page. Location fantastic for doing all the sights, we walked everywhere. Lovely views of the Cathedral and Giralda from upper terrace. Supermarket, shops and good restaurants in the immediate vicinity. Will definitely return to this apartment again. Only minus extract in toilet not working properly. The whole process was so simple. Easy to book (and easy to change our booking!) and easy to arrive and get into the flat. The website video had been so 'revealing' that it was exactly as we expected (if not better). When we asked for another set of keys, they were delivered. Also, the flat was wonderfully well-equipped - everything you could want was there (unlike a more expensive flat last year in Rome that didn't even have a kettle). Perfect. "Lovely spacious warm deck good views, tastefully decorated, comfortable, quiet, good bed good washing machine, nice neighborhood"